Sham with 0.625" applied woven tape detail between body face and fringe. 1" self frayed edge on all sides. Back self covered fabric button closure. Sham with mesh inset border. Viscose/linen; cotton. Feather insert included. Dry clean. 27" square. Made in the USA of imported materials. Made of smooth, lustrous 624-thread-count cotton sateen. Detailed with a single row of elegant hemstitching. 26"Sq. Machine wash. Imported. Sham of 140-thread count slub cotton. Buttoned placket closure at the back with signature "RL" buttons. 2" stitched flange. 20"
Sham of 140-thread count slub cotton. Buttoned placket closure at the back with signature "RL" buttons. 2" stitched flange. 20" x 28". Machine wash. Imported. 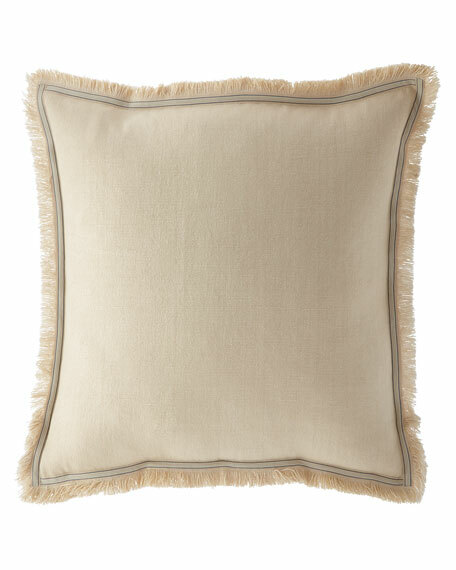 EXCLUSIVELY AT NEIMAN MARCUS Basketweave sham. 2" contrast linen flange. Linen back with zip closure. Polyester/acrylic/cotton/rayon. Dry clean. 26"Sq. Made in the USA of imported materials.